Posh full-back Michael Smith (right) is battling to be fit to face Gillingham. Photo: Joe Dent/theposh.com. 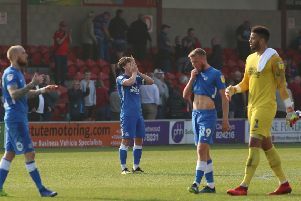 Peterborough United manager Dave Robertson insists tomorrow (August 29) is the perfect time for his out-of-form side to tackle League One leaders Gillingham at the ABAX Stadium (3pm kick-off). Posh have lost their last three competitive matches, conceding nine goals along the way. They’ve lost three of their four League One matches so far this season. In contrast Gillingham are unbeaten in their four League One games and they’ve already beaten promotion favourites Sheffield United (4-0) and Wigan (2-0). But Robertson believes early-season league tables can be misleading. “I won’t take any notice of the league table until everyone has played 10 games,” Robertson stated. “It’s too early in the season. Form hasn’t settled down yet. You get a better idea of how strong every team is after 10 matches. “We have to play every team twice in a season and there’s no better time for us to play Gillingham as far as I’m concerned. “We win this game and everyone is automatically more positive. “It won’t be easy of course. I know Gillingham manager Justin Edinburgh very well, He’s galvanised Gillingham from the day he got the job there. “They’ve made an excellent start to the season, but we are going into the game in a very positive frame of mind. Robertson hasn’t given up hope on full-backs Michael Smith and Kgosi Ntlhe winning their fitness battles. If they don’t Posh could again employ three centre-backs as they did in Tuesday’s (August 25) 4-1 Capital One Cup home defeat at the hands of Charlton. Gillingham have star striker Cody McDonald available. He has yet to start a game this season because of injury. Midfield playmaker Erhun Oztumer is unlikely to be involved despite a hat-trick in an 8-0 friendly win for Posh reserves at Boston United this week. Kyle Vassell (2), Jack Friend (2) and Harry Beautyman also scored. Friend is currently on loan at Boston.